The rosy young woman caught in a moment of stillness is a familiar image in the Sacred Heart family, especially today, when we celebrate her feast under the title of Mater Admirabilis. But, as an article by our general archivist on our international website explains, Mater's creator, Pauline Perdrau continued to paint copies of the original fresco throughout her life. These were copies but not exact, faithful replicas, as there were always changes, of varying degrees of subtlety, in the details. Some playful birds in one, different stars in another; some variations in colour and background throughout - and, often, subtle changes to the size and contents of her workbasket. More recently there have been some newer versions and adaptions from around the world: two years ago my attention was drawn to this one, by Min-Ah Cho NSCJ, who has given me permission to use it. It is recognisably Mater, in all her stillness, though with extra dynamism. But the most immediate, obvious difference is in that workbasket, now transformed into a cradle. The tiny figure in it should still be familiar, even after two years: Alan Kurdi, the Syrian Kurdish toddler who drowned in the Mediterranean and was found, washed up on a Turkish beach, his tragic, unnecessary death highlighting the plight of so many desperate refugees. We call this image of Mary Mater Admirabilis - Admirable Mother - and indeed, who better than a loving mother for taking care of a baby whose own mother drowned, unable to save him? As I look at this image I find myself wondering: who, or what situation, would I place in Mary's basket and confide to her maternal care? What fragility or place of pain; what need or urgency, grief or inadequacy? With what work would I fill up her workbasket? 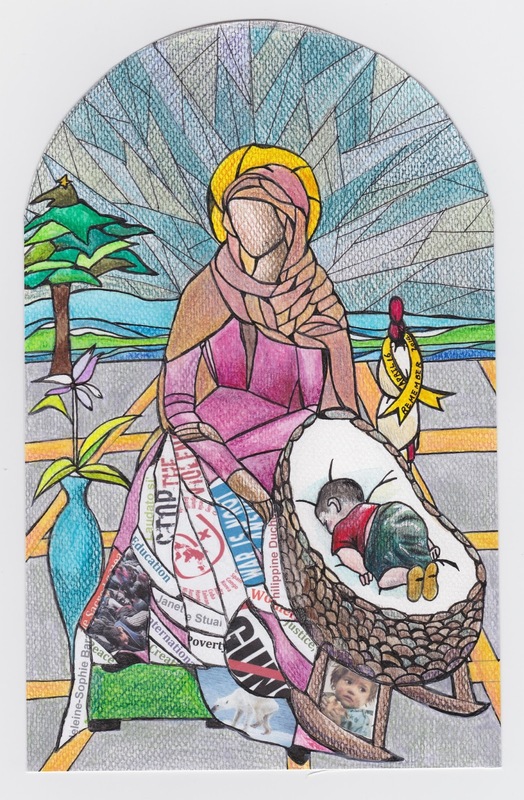 The list is long, seemingly endless: but as with the ever-widening Heart of her Son, in which there is room for all, so too with Mary's workbasket, constantly expanding, to allow itself to be filled with all the pain as well as the joy and beauty of the world. And you... who or what would you place in Mary's basket, and in her tender, solicitous care...?